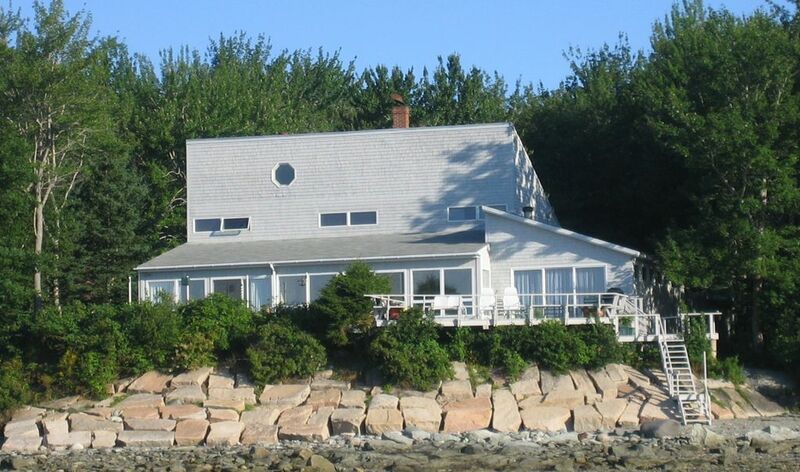 Bar Harbor View Cottage is the perfect place for your next trip to Maine. You will be delighted when you first see the stunning panoramic views of Acadia National Park and its mountains from our deck. Make sure you get up in time for sunrise as you'll be able to see it come up over Cadillac Mountain. You'll be able to spot wildlife without even leaving your chair. You may see eagles, seals, dolphins, deer and moose. You can even take our kayaks across the bay to see seals up close and personal. The water near the cottage is teeming with mussels too. Kids (of all ages) love the abundance of flat rocks along the shoreline that are perfect for skipping and the custom-built ping-pong table in the garage. The cottage features four bedrooms which sleep nine, WiFi access, panoramic views, a well-stocked kitchen, a garage, ample parking, a ping-pong table, several kayaks, a gas grill and a gorgeous deck perfect for relaxing. The main floor has the master king suite with adjoining bathroom, a second bedroom with a queen bed, kitchen, living room, dining area, den, laundry room and second bathroom. There is also an attached garage. The second floor offers two bedrooms. One has two twin beds and the other features a queen bed plus a twin bed. We are about 16 miles from downtown Bar Harbor. Rick and Shelby Kinnaird currently live in the suburbs of Richmond, VA. Rick is retired from the computer industry and is working on his first novel. Shelby has a food blog called Diabetic Foodie and also works as a freelance web designer. The Western Bay is part of the Atlantic Ocean. You have an unsurpassed view of the ever changing tides. Looking across The Western Bay to Mount Desert Island you are treated to an unobstructed view of Cadillac Mountain, the highest point on the eastern seaboard. The house sits so close to the ocean that at high tide you look directly down from the deck to the ocean 20 feet below. First floor is 3,314 sq ft including a 973 sq ft garage. Second floor is 1,034 sq ft. Total living space is 3,375 sq ft. Close to Bar Harbor and Acadia Nat. Park 15 - 20 minute drive Real Maine beach. Not mud flats. Awesome views and great home! We enjoyed staying at the bar harbor view cottage. It was everything we we expecting and more. Love the fireplace on the cool rainy days. Close to Bar Harbor and Acadia. Enjoyed visiting the local lobster pounds. Especially like the Union River lobster pot. The mornings and evenings on the deck we're relaxing. Would recommend if you are in the area. I'm a repeat renter at this property which has all the amenities one could ask for and more. This home is lovely. It is right on the water, the sunrises from the deck are spectacular. It is convenient for trips to Acadia. The house is well stocked with supplies, and the people were lovely to deal with. We had a wonderful time. I would definitely use this home again. It is private, and tucked away, and yet very accessible to everything around. We were well pleased. This location provided all that we needed for a week in Maine. Well equipped house and plenty of kayaks, vest, paddles to enjoy the water. Lobster Pound was a big hit on the restaurant front. This was a great place to stay for our family of 9--six adults and three grandchildren. The ocean view was fantastic. We were not far from what we wanted to see and do, mainly hike in Acadia and drive to Campobello in Canada, about two hours away. (Remember your passports.) It's a beautiful area and the free tour or FDR's summer home was fun and interesting. We hiked three different days in Acadia. The Cadillac Mountain drive was beautiful. Didn't make it to the very bottom of the gorge in Cadillac Mountain on our hike (some of us are 75), but we saw enough to satisfy us without leaving us totally exhausted. Plus, we couldn't keep up with the grandkids! The Desert Mountain trail was also beautiful with wonderful views. The Bar Harbor house had plenty of rooms and beds for all. It was well equipped and lacked for nothing. An upstairs bathroom would have been nice, but the two downstairs were certainly ample. The kitchen was so well stocked we cooked a lot of our meals there, cutting down on eating expenses. We had to clean out the refrigerator before we left, thus we had to throw away almost new bottles of catsup, salad dressing, a half pound of butter, etc. I wish we could have left it for the next guests or someone else to use. We used the washer and dryer almost daily, and we all agreed we way overpacked. Did one day of shopping in Ellsworth and Bar Harbor. Very touristy but fun. The carnivores in our group ate at different seafood places, enjoying lobster, clams, etc. I think Trenton Bridge Lobster Pound was one of their favorites. Pat's Pizza had a wonderful menu that satisfied all our dietary preferences. 86 This! in Ellsworth had wonderful wraps and burritos. We lucked out with beautiful weather. The ocean was usually too rough for us to use the kayaks, but we did take one out for a short while one day. My son brought along a lot of fishing gear and bought a four or five day fishing license, but he really couldn't fish from where we were at, and as I said, the ocean was too rough to fish from a kayak. It really didn't matter because there were plenty of other things to do. I highly recommend a stay at the Harbor View if you want a spectacular Maine experience. I can understand why some people go back year after year. The cottage was exactly like it was listed plus the owners arranged for a week of fabulous weather for us (smile). Seven ladies were very comfortable in this spacious cottage. The kitchen offered abundant dinnerware and cookware. It was stocked with all the supplies needed to begin our week stay. We had coffee each morning on the large deck with comfortable chairs to enjoy the breathtaking view. The large dining room table provided the perfect place for our nightly board games or cards. All the beds were super for a great nights sleep after our full fun days. The area attractions such as Bar Harbor and Acadia National Park kept us on the go. We rented bikes in Bar Harbor and rode on the Carriage Paths to Jordon's Pond for lunch and popovers on the lawn. (Highly recommended experience for scenery and cuisine) Several in our group voted that day the trip favorite. Hiking the Beehive Trail in Acadia National Park was a personal favorite but all the hikes were enjoyable. Bar Harbor is a fun town with lots of shops and dining opportunities. Massages at The Bar Harbor Inn Spa started our vacation week by relieving the stress from our long flight ---Montana, Idaho and South Dakota--- a long ways away. Location and privacy of this property is suberb. The owners are very receptive to questions and suggested several books to read before our trip. Great week vacation due to this awesome cottage and its amenities plus gorgeous area to explore. Must get lobsters at least once from the Trenton Bridge Lobster Pound. Enjoy dozens of hiking trails through Acadia National Park (easy to extremely challenging). Don't miss the popovers and strawberry jam at Jordan Pond House (but be prepared to wait for a table). We sometimes honor requests for partial week rentals. Contact us if you are interested. Regarding cancellation policy, if we are able to rebook our home, all monies paid to date less a $100 cancellation fee and any applicable taxes will be refunded to you when final payment is received for the new reservation. If we are unable to rebook our home, the full rental amount, including taxes and all applicable fees is due and payable by the check-in date on the reservation.